Keep a stash of these in the fridge for when you get a snack attack. 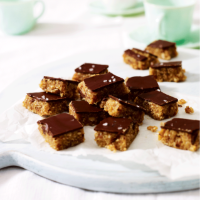 They’re great for taking to work or for after dinner instead of a rich pudding. Children will love them too. 1. Place the coconut and cashew nuts in a food processor and whizz until finely chopped. Add the dates and maple syrup, and whizz to make a coarse paste. 2. Spread the mixture out on a sheet of baking parchment and, using a small palette knife, shape into a 15cm square with a thickness of about 1.5cm. Place in the fridge. 3. Melt the chocolate and coconut oil or butter together in a heatproof bowl set over a pan of simmering water. Once melted, spread over the date mixture, sprinkle with sea salt (if using) and return to the fridge until set. Cut into 25 small pieces and store in an air-tight container in the fridge for up to 5 days. To easily cut up the bites, remove the set mixture from the fridge and allow to come to room temperature. Then dip the knife in hot water so it cuts through the chocolate neatly.